MACON, GA. (Seminoles.com) – Junior guard Nicki Ekhomu came through when it mattered most, scoring 27 points to lead Florida State Women’s Basketball (8-1) to a 57-56 nail-biting win at Mercer (4-5) on Wednesday night at Hawkins Arena. Ekhomu scored 18 second-half points, with big buckets down the stretch. A 3-point field goal by KeKe Calloway gave Mercer a 52-48 lead with 5:31 remaining, but Ekhomu started a 7-0 run of her own to give FSU a responding 55-52 advantage. The Bears quickly struck back with two big baskets, taking a 56-55 lead with 2:15 remaining. But Ekhomu came back again, responding with another tough mid-range jumper to put FSU ahead by one with two minutes left. After an over-and-back call on the Seminoles gave Mercer the ball at half court with three seconds left, Ekhomu drew a charge underneath to secure the win for the Seminoles. FSU out-scored Mercer 31-22 in the second half, getting big stops when they needed it most. Redshirt junior Kiah Gillespie added her third double-double of the year with 14 points and 12 rebounds, and junior guard Nausia Woolfolk treated the hometown fans to 12 points. Freshman Valencia Myers added eight rebounds for the Seminoles, grabbing every important rebound late in the fourth quarter. Mercer senior guard Calloway led the Bears with 21 points. For the third time this season, Florida State trailed at the half as it went into the locker room down 34-26. 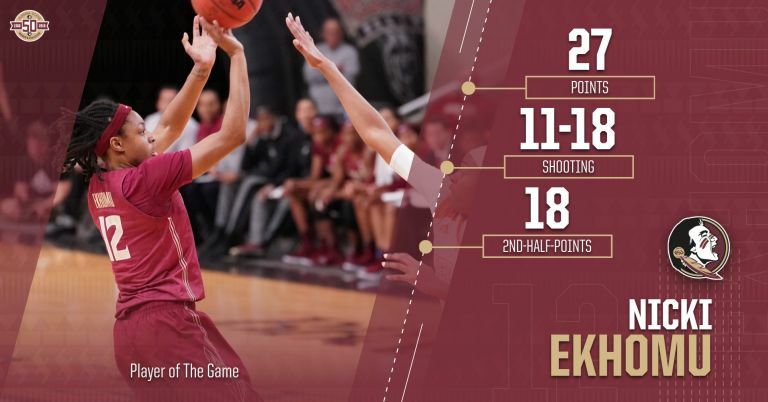 Ekhomu aided FSU late in the first half with a 7-0 run by herself to bring FSU’s deficit to 24-20. With 1:54 remaining in the second quarter, Gillespie nailed a 3-pointer to creep the Seminoles to 30-26, but a couple scores by the Bears in the final 1:38 gave them the eight-point advantage. However, a 10-0 run in the third quarter led by Ekhomu brought FSU back into the game after trailing by as many as 12 in the second half. The Seminoles finish their two-game road swing on Sunday afternoon when they play at St. John’s at 2 p.m. on ESPN3. With final exam week coming up on Monday, FSU does not play at home again until hosting Creighton on Sunday, Dec. 16, at 2 p.m.